by Chris Woodford. Last updated: December 19, 2018. Zap! When a bolt of lightning leaps to the ground, we get a sudden, very vivid demonstration of the power of static electricity (electrical energy that has gathered in one place). Most of us know that static builds up when we rub things together, although that's not really a satisfying explanation. What is it about rubbing things that produces an electrical phenomenon? 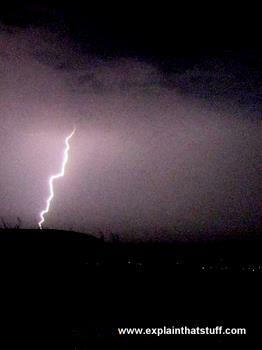 Although lightning is a spectacular example of static electricity, it's not something we can harness. But there are many other places where static electricity is incredibly useful; from laser printers and photocopiers to pollution-busting power plants, static can be really fantastic. So let's take a closer look at what it is and how it works! Photo: A lightning bolt is a huge release of static electricity, in which built-up electrical potential energy shoots from the sky to the ground in a sudden, improvised, electric current. If you want to photograph lightning, set your camera to take multiple, continuous shots and be prepared for a very long wait: it took me two hours and hundreds of vain attempts to capture this single shot. Photo: Classic static: When you rub a balloon on your pullover, you create static electricity that makes it stick. The rubbing shifts electrons from your pullover (which becomes positively charged) to the latex rubber in the balloon (which becomes negatively charged). The opposite charges make the two things stick. We take electricity for granted: it's easy to forget that homes, offices, and factories have been powered in this clean and convenient way only since the end of the 19th century—which, in the broader run of human history, is no time at all. It was during the 19th century that pioneers such as Alessandro Volta, Michael Faraday, Joseph Henry, and Thomas Edison figured out the secrets of electricity, how to produce it, and how to make it do useful things. Before that, electricity was largely a curiosity: it was very interesting for scientists to study and play with, but there wasn't much else they could do with it. In those days, people cooked and heated their homes using wood or coal stoves and lit their rooms with candles or oil lamps; there were no such things as radios or TVs, much less cellphones or computers. The "modern electricity" that powers everything from the phone in your pocket to the subway you ride to school or work is what we call current electricity (or electric current). It's energy that travels down a metal wire from the place where it's produced (anything from a gigantic power plant to a tiny battery) to the thing it powers (often an electric motor, heating element, or lamp). Current electricity is always on the move, carrying energy from one place to another. 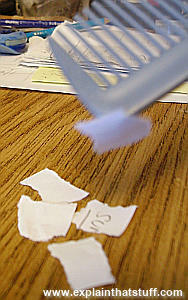 Photo: Another classic demonstration of static: rub a plastic comb on your pullover and you'll find you can pick up tiny pieces of paper. It's a little bit like picking up paperclips with a magnet. But where a magnet can pick up one paperclip, and the magnetized paperclip will pick up others in a chain, a static-charged ruler won't do the same thing. Why do you think that is? Before the 19th century, the only kind of electricity people really knew about or tried to use was static electricity. The ancient Greeks understood that things could be given a static electric "charge" (a buildup of static) simply by rubbing them, but they had no idea that the same energy could be used to generate light or power machines. One of the people who helped to make the connection between static and current electricity was American statesman, publisher, and scientist Benjamin Franklin. In 1752, when Franklin tried to figure out the mysteries of electricity, he famously did so by flying a kite in a thunderstorm to catch himself some electrical energy (an extremely dangerous thing to do). A lightning bolt zapped down the kite to the ground and, had Franklin not been insulated, he might well have been killed. Franklin realized that static electricity, accumulating in the sky, became current electricity when a lightning bolt carried it down to the surface of the Earth. It was through research such as this that he developed one of his most famous inventions, the lightning rod (lightning conductor). Franklin's work paved the way for the electrical revolution of the 19th century—and the world really changed when people such as Volta and Faraday, building on Franklin's discoveries, learned how to produce electricity at will and make it do useful things. Just quickly, in passing, it's worth noting that there's another way to think of static and current electricity and to relate them to things we already know about energy. We can think of static electricity as a kind of potential energy: it's stored energy ready and waiting to do something useful for us. In a similar way, current electricity is (loosely speaking) analogous to kinetic energy: energy in movement—albeit of an electrical kind. Just as you can turn potential energy into kinetic energy (for example, by letting a bolder roll down a hill), so you can turn static electricity into current electricity (that's what a lightning bolt does) and back again (that's how a Van de Graaff generator works). Just like the ancient Greeks, we tend to think static electricity comes from rubbing things. So if you live in a home with nylon carpets and metal doorknobs, you'll soon learn that your body builds up a static charge when you walk across the floor, which can discharge when you touch a doorknob, giving you a tiny electric shock. In most school experiments, we also learn about static by rubbing things. 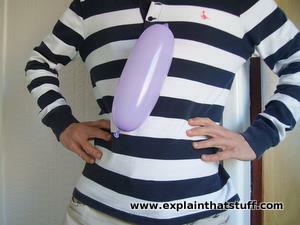 You've probably tried that trick where you rub a balloon on your clothes to make it stick? You might conclude from this that static electricity is somehow connected to friction—that it's the very act of rubbing something vigorously that produces a buildup of electrical energy (in the same way that friction can produce heat and even fire). It's not the rubbing that's important but the fact that we're bringing two different materials into contact. Rubbing two things together vigorously simply brings them into contact again and again—and it's this that produces the static electricity through a phenomenon known as triboelectricity (or the triboelectric effect). All materials are built from atoms, which have a positive central core (the nucleus) surrounded by a kind of fuzzy "cloud" of electrons, which are the really exciting bits. Now some atoms have a more powerful pull on electrons than others; a great deal of chemistry stems from that fact. If we put two different materials in contact, and one attracts electrons more than the other, it's possible for electrons to be pulled from one of the materials to the other. When we separate the materials, the electrons effectively jump ship to the material that attracts them most strongly. As a result, one of the materials has gained some extra electrons (and becomes negatively charged) while the other material has lost some electrons (and becomes positively charged). Hey presto, we have static electricity! When we rub things together again and again, we increase the chances that more atoms will take part in this electron-swap, and that's why a static charge builds up. 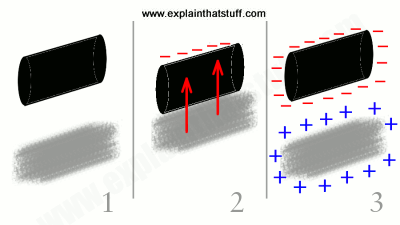 Photo: How the triboelectric effect explains static electricity: 1. Ebonite (hard vulcanized rubber—shown here as a black rod) and wool (shown as gray) normally have no electric charge. 2) Put them in contact and the ebonite attracts electrons from the wool. 3) Separate them and the electrons remain on the ebonite, making it negatively charged and leaving the wool with a lack of electrons (or a positive charge). Rubbing the two substances together increases the contact between them and makes it more likely that electrons will migrate from the wool to the ebonite. The negative charge on the ebonite is exactly the same size as the positive charge on the wool; in other words, no net charge is created. If you experiment with different materials, you find some gain positive charges when they're rubbed and some gain negative charges; some materials also gain more charge than others. It turns out that we can rank materials in order according to the charge they gain, giving us a kind of league table of materials running from positive to negative. Different books and web pages show slightly different lists, but they all broadly run from minerals (positive) through such things as wood and paper (neutral) to plastics (negative). Don't worry too much about the exact order of the list; it's going to vary for all kinds of reasons (the kind of glass or the additives in the latex, for example). This list is called the triboelectric series. The further apart two materials are in the series, the more static electricity will build up when you rub them together. If two materials are very close in the series, it's hard to get them to build up any charge at all no matter how hard you rub them. That would seem to confirm that static electricity isn't about rubbing, per se, but about the nature of the materials we bring into contact. What you've just read is the traditional, widely accepted explanation of static electricity—and you'll still find it described that way in most school books. But in 2011, scientists reported some important new discoveries that seemed to suggest much more was going on. Instead of being purely a matter of physics, and a simple transfer of charged electrons from one material to another, it seemed static electricity could also be caused by chemistry (movement of ions and other essentially chemical processes). And it could also happen through a swapping of small amounts of actual material (a bit of balloon shifting to your pullover or vice versa). 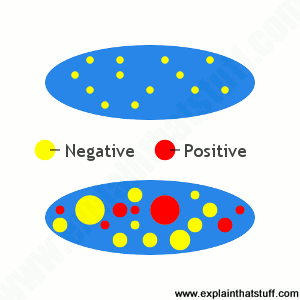 Where we used to think of static as a simple "pile" of negative or positive charge (electrons or a lack of them), on closer inspection, it now appears to be a "mosaic" of both positive and negative charges that add up to an overall charge (positive or negative). This research is very new, and still evolving, but it seems clear that our traditional explanation of static electricity is an oversimplified version of what's really happening, even if we've faithfully believed it for over 2000 years! Artwork: Top: The traditional theory sees a static charge on a balloon as an even spread of charged particles across its surface. Bottom: According to the latest thinking, a static charge is actually a random "mosaic" of much bigger charges, which can be both positive and negative, and which add up to an overall charge. In this case, there's much more negative charge than positive (yellow than red), so our balloon has an overall negative charge. What You Learned About Static Electricity Is Wrong by John Timmer. Wired, June 25, 2011. A Shocking New Understanding of Static Electricity by Douglas Main. Popular Mechanics, June 29, 2011. The Mosaic of Surface Charge in Contact Electrification by H. T. Baytekin, A. Z. Patashinski, M. Branicki, B. Baytekin, S. Soh, and B. A. Grzybowski. Science, July 15, 2011, Vol. 333, Issue 6040, pp.308–312. Antioxidants dispel static electricity by Richard Van Noorden. Nature, September 19, 2013. What Creates Static Electricity? by Meurig W. Williams. American Scientist, Volume 100, July/August 2012, pp.316–323. What use is static electricity? Now static electricity is all very interesting, but what possible use is it? You can't make toast from a lightning bolt and you can't charge your cellphone simply by rubbing its case on your pullover. You might think static is one of those fascinating but ultimately quite useless bits of science that has no practical applications—but you'd be wrong: static electricity is used in all kinds of everyday technology! Laser printers and photocopiers use static electricity to build up ink on a drum and transfer it to paper. Crop spraying also relies on static electricity to help herbicides stick to the foliage of plants and distribute themselves evenly over the leaves. Factory paint-spraying robots use a similar trick to ensure that paint droplets are attracted to metal car bodies and not the machinery around them. In many power plants and chemical factories, static electricity is used in smokestacks to scrub away pollution (read more in our article on electrostatic smoke precipitators). Photo: How can you stop air pollution spewing out from smokestacks? One way is to give a static electric charge to smoke, then funnel it through a grid of metal plates with an opposite charge, so the dirty soot particles are removed. 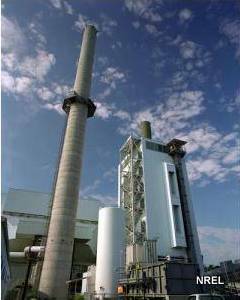 That's how "scrubbers" (electrostatic smoke precipitators) work, such as the ones installed in these smokestacks at the McNeil biomass power plant in Burlington, VT. Photo by Warren Gretz courtesy of US DOE National Renewable Energy Laboratory (NREL). Of course, static electricity has its drawbacks too. It can cause sparks and explosions in fuel depots and stray static is a real nuisance if you're working with electronic components. That's why engineers and chemists have developed all kinds of anti-static technologies (from simple wires to ingenious, slightly conducting paints and coatings) that prevent static buildup in sensitive places. While you're reading these words, you can be sure that someone, somewhere is trying to find a new way to harness static electricity or a better way to stop it causing problems. Static electricity may be stationary, but it's never standing still! Why static electricity is really triboelectricity: An excellent video introduction to triboelectricity from Steven Dufresne. Eyewitness: Electricity by Steve Parker. New York: Dorling Kindersley, 2005. A good solid introduction to electricity from a dependable children's science writer. Routes of Science: Electricity by Chris Woodford. New York: Facts on File, 2004: One of my own books, this volume takes us through the complete history of electricity, from the ancient Greeks to modern times. Cool Science: Experiments with Electricity and Magnetism by Chris Woodford. New York: Gareth Stevens, 2010: Another of my books, this one is a short and simple hands-on guide to electricity and magnetism. Hazards of Electricity and Static Electricity by BP Safety Group. Institution of Chemical Engineers, 2006. What are the dangers of static electricity and what can we do to minimize them? Fluttering Flag Generates Power From Wind by Prachi Patel. IEEE Spectrum, January 13, 2016. A radical new "wind turbine" uses the principle of triboelectricity to make power. Clean like Harry Potter with this dust-busting magic wand by Charlie Sorrel. Wired, August 5, 2011. If static electricity helps to make things dusty, can it help to clean them as well?